Indoor bouldering is arguably the most accessible form of climbing and requires the least amount of equipment, says Jordan Buys, coach at BMC Youth Academy and former member of the GB Bouldering Team. Originally bouldering was climbing on rocks that weren’t large enough to warrant a rope, but it has now developed into a very popular style of rock climbing in its own right. These short, tricky and worthwhile problems reduce the essence of climbing to something brilliantly minimalist. Bouldering offers great freedom of movement, requires hardly any equipment and you don’t need a partner to hold your ropes.The same benefits meant more climbers wanted to boulder at indoor walls. Purpose-built bouldering walls began to appear, providing inventive problems on a variety of angles with soft matting underneath. 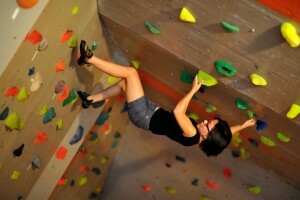 Initially indoor walls were used as training or a wet weather alternative to climbing outdoors. Recently, though, the evolution of indoor walls has transformed the experience into a new sub-sport, and some climbers exclusively boulder indoors. All you need is a pair of rock shoes, a chalk bag and someone to point you in the right direction. Most walls these days rent out shoes and many have a gear shop on site if you wish to buy your own kit. What is the grade system? Most bouldering walls set Fontainebleau (the French bouldering mecca) style colour-coded circuits, where all the problems of a particular colour are at a similar level of difficulty. Some walls use V grades (V0, V1, V2…), others use Font grades (Font 4, 5, 5+, 6A…). Climbing walls cater for the full spectrum of abilities – novices will rub shoulders with the cream of the crop. Don’t feel intimidated. Even the best had to learn the basics of movement skills. Focus on technique. Strength will come but don’t rush it as bouldering can be highly stressful on your body. You tend to do more hard moves in a session than when climbing routes (with ropes). How can I improve my technique? The beauty of indoor bouldering is that technique and movement skills can be practised on various angles and hold types that work your individual weaknesses, at your own pace. Aim to climb your warm ups in the best style possible. Practise various drills such as flagging (where a leg is held in a position to aid balance, rather than to support weight) and heel hooks (using a heel on a hold for balance or leverage) on easier ground. This will instill good habits for harder territory. Watch others who move well, analyse what makes them good climbers and try to emulate their techniques. How long is a bouldering session? When you first try indoor bouldering, it probably won’t be long before your hands and forearms protest. As your body responds and adapts to the demands you are putting on it, you should eventually be able to manage two – three hour sessions. Learn to listen to your body from the beginning. If your hands and feet hurt, go home. You will then be able to go climbing again pretty soon, which is far better than having to spend a long time healing from injury. Bouldering can be an independent game or a sociable one. You have a chance to climb with others and try the same problems or you can seek solitude if you prefer. If you find that you have completed all the climbs that you can do at your local wall, you could try making your own problems up, or perhaps make the effort to visit a different bouldering wall. Keep an eye out for friendly bouldering competitions to enter – they offer a great social scene and lots of fresh problems to try.